A photo by Raewyn Turner of the SCANZ rooms in 2011. SCANZ has been the main Intercreate project. Intercreate is a community of people in Aotearoa New Zealand and internationally, who are interested in art, science, technology and cross cultural projects. Our major project is based on a residency with a focus on the environment. Intercreate Trust arose from the Solar Circuit Aotearoa New Zealand (SCANZ) residency in 2006. The trust is an umbrella for activities that includes residencies, symposia, workshops, exhibitions and media art projects. Intercreate Trust is a not-for-profit charity that is registered with the Charities Commission of New Zealand (our Registration Number is CC32791). For more Information about the trust including annual reports, please visit the Charities Register at www.charities.govt.nz. Trustees and associates are listed below. 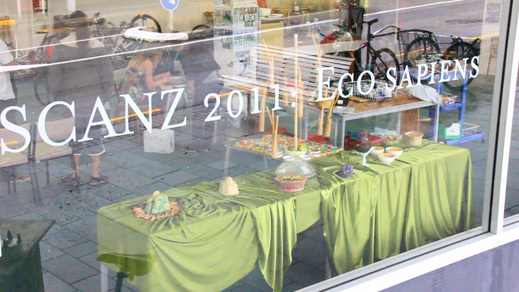 Projects have included: three SCANZ events, in 2006, 2009 and 2011 involving residency, exhibitions and public presentation, workshops, and hui/symposia. Since 2011 the centre has worked closely with Dr Te Huirangi Waikerepuru on several projects. Wai was presented at ISEA 2012 Albuquerque Machine Wilderness. Te Kore Rongo Hungaora: Uncontainable Second Nature was curated for ISEA 2011 Istanbul and also presented in Rio de Janeiro at Cultura digital. International Research Fellow Nina Czegledy is working with the centre on a number of projects. As well as special international sessions of SCANZ symposia she organised Space sense joint Canada-New Zealand project which included a residency period at Banff. The resultant work Atmosphere and Areosphere with collaborator Janine Randerson was showcased during SCANZ 2011: Eco sapiens, projected on the New Plymouth Observatory dome. Interdisciplinary creative projects such as The Park Speaks involved a team of collaborators where data controlled spoken words are played over two computers incorporating dual desktop video and triple data projection. The system was built by Ian Clothier, Andrew Hornblow, Julian Priest and Adrian Soundy. The Park Speaks involved a networked botanical garden and data sensors where data readings are translated into spoken phrases. It was exhibited in Puke Ariki Museum. Haiku robots, was a robotic art work in collaboration with engineer Andrew Hornblow and Julian Priest as software author. It generates live, word lists letter by letter dynamically and was also exhibited in Puke Ariki. Branch on branch was an augmented reality artwork in conjunction with the Human Interface Technology Lab NZ. Recent projects include exhibitions engaging tangata whenua, Te Matahiapo, artists, scientists and digital media based on themes shared by Maori and European thinking, for Istanbul and Albuquerque; SCANZ 2013: 3rd nature in Nga Motu, New Plymouth, Aotearoa New Zealand; and the Media Art Project 2014 Ko Tatou te Tangata. Please contact Ian Clothier or Trudy Lane for any enquiries. For further biographies of the core Intercreate team please see the Intercreate Team page.